For the finale of season 16 of Top Chef, Eric Adjepong announced that his final meal on the show would “tell the story of the transatlantic slave trade and how those flavors migrated to the South.” No small feat, especially when compared to the other contestants, Kelsey Barnard Clark from Alabama and Sara Bradley from Kentucky, who set out to cook the Southern food they grew up loving. Southern food, however, is forever tied to the story that Adjepong wants to tell about West African food. Grits and cornbread, for example, came from techniques slaves used to stretch meager rations. Cornbread was Barnard Clark’s first dish. Adjepong never had a chance to tell the story as planned. He was eliminated after his first course because the chips were burnt and the tartare had too many spices for the judges’ liking (Barnard Clark won the season). That doesn’t mean he’s done telling the story of West African cuisine and the cuisines that it’s influenced, though. 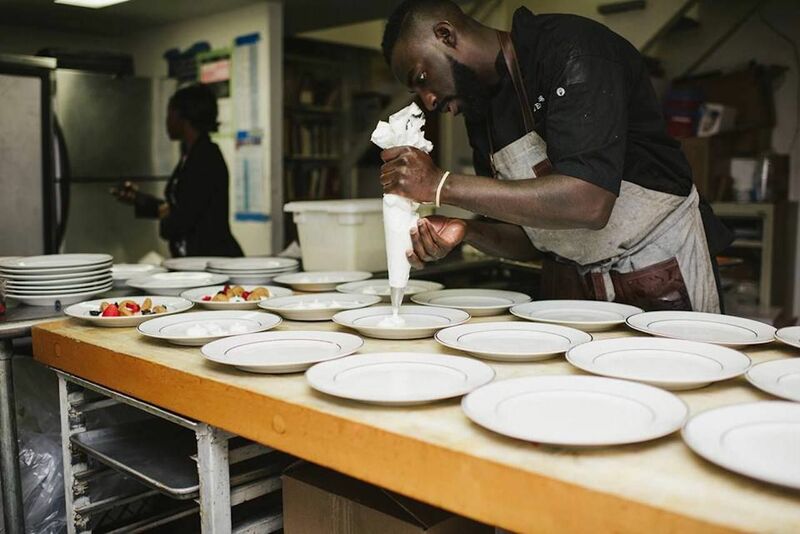 Top Chef helped give Adjepong a voice, and there’s still a lot Adjepong has to say. To start, there’s the question of why it’s taken so long for West African food to be recognized in Western cultures. How understanding food helps you understand people. 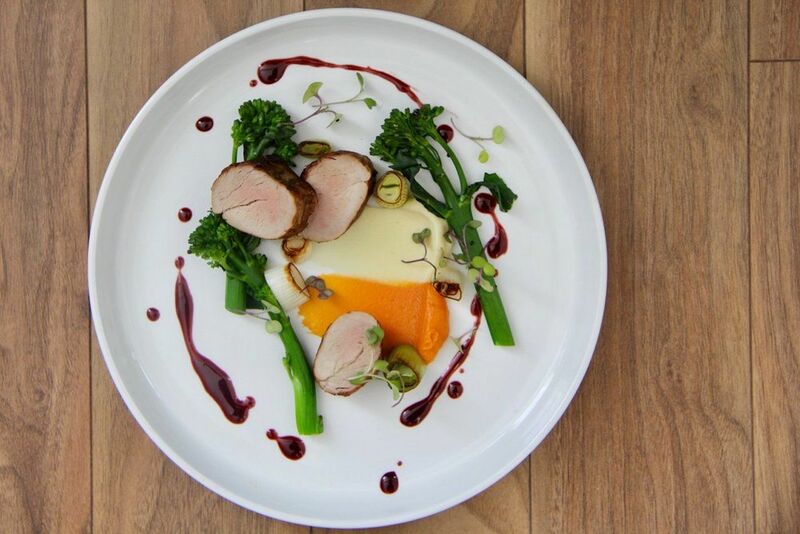 Food tells a story and opens the door for conversation in ways that nothing else can. Adjepong was born shortly after his parents moved from Ghana to New York City and grew up in the Bronx in the late ‘80s and ‘90s. They cooked traditional Ghanian food at home and were able to source many of the ingredients they were familiar with. Adjepong “had that dichotomy of growing up with West African parents in a very traditional home,” he says, as well as the chance to try food from other cultures thanks to being in a diverse neighborhood. His upbringing was the starting point to understanding how the world is connected through what we eat, and he’s been tracing those connections throughout his career. He earned a degree in culinary arts from Johnson & Wales in Providence, Rhode Island, and worked in New York restaurants before studying international public health at the University of Westminster in London. For the latter, he traveled to Ghana and wrote his thesis about Maggi bouillon cubes in West African cooking. The Nestle product replaced the traditional, slow-cooked broths in Ghana in the ‘80s and ‘90s during a period of increased industrialization and also coincided with an increase in noncommunicable diseases like heart disease and hypertension. Maggi cubes have become an indispensable ingredient for chefs in the country, though, and there was even a bouillon cube Quickfire challenge on Top Chef this season, in which Adjepong placed in the top three. It’s impossible to ignore foods taken from the African diaspora when you start to look. Take jambalaya, for example, which can be traced back to jollof rice. Ingredients vary based on which region you’re in, but Adjepong has compared it to the paella of West Africa. Jollof changed when interpreted by African slaves in the Caribbean, then changed again in the Southern US. The reason it’s here, however, goes back to the transatlantic slave trade. 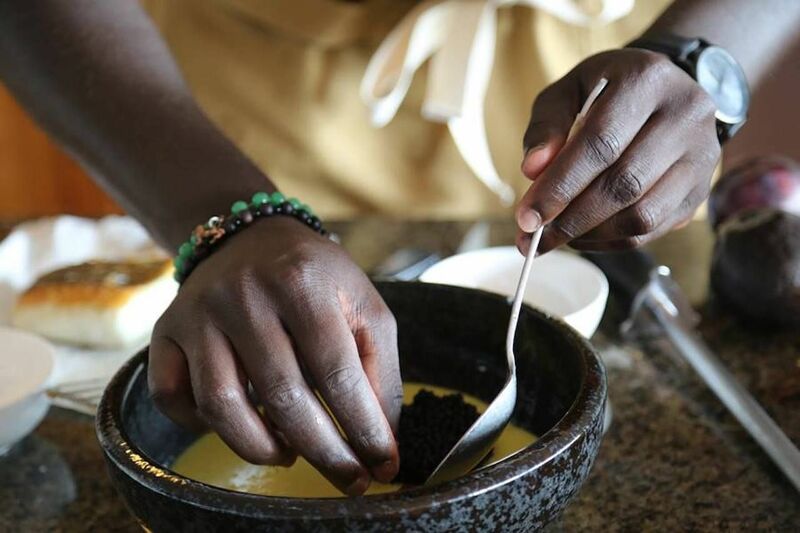 Learning about West African cuisine is, for many Americans, learning about the origins of some of their own food they grew up with. It opens the door to talk about how we came to eat what we eat and why, which can jump-start conversations about history and culture and people in general. At least, as long as people are open to having those conversations. “Chefs are always here to tell a story and teach you their food,” Adjepong says but adds, “You’ve got to seek knowledge yourself” too. Adjepong came in third in Top Chef, much to the consternation of fans. His appearance, however, has given him a platform for his cooking and the stories he wants to tell. Shortly after the final episode aired, Adjepong went to the Washington Post offices and cooked the rest of what his last meal about the transatlantic slave trade would have included. He made lobster tail with yassa onion jam, puffed black rice, and palm wine nage. Another course had scallops and goat with a tamarind glaze, cassava pave, and piri piri jus. For dessert, he made goat milk and corn pudding. The dishes and ingredients were inspired by those from Senegal, Portugal, Nigeria, Angola, Mozambique, America, and the Caribbean. If anyone can help start a conversation about West African food and its role in contemporary American cuisine, it’s Adjepong. He’s charismatic and attractive (People magazine named him a finalist for sexiest chef alive in 2018) and has developed his ideas through extensive travel and education. Plus, as proven by his Top Chef run, he’s willing to address big themes and topics head-on. Outside of media appearances, Adjepong is continuing to work on his business Pinch & Plate, which he runs with his wife, Janell. He’s in the early stages of a restaurant that is set to open sometime in 2020, and the dishes he never had a chance to serve on Top Chef will be on the menu along with other items that continue to tell the same story.